If your wood-paneled walls seem dark and dated, painting is a great way to brighten them up. Follow these simple steps to achieve a professional-looking, up-to-date finish. In a room with wood-paneled walls—particularly if that wood is a veneer—your instinct may be to start fresh, either by tearing out the paneling or by concealing it behind drywall. Both of these options, however, involve avoidable expenses that may be difficult to justify if you are trying to keep costs to a bare minimum. So long as your paneling has stayed in decent condition over the years, perhaps the least expensive way forward is to leave the paneling in place and paint over it. That may be easier said than done, partly because solid-wood paneling so often has knots, the kind that appear invincible to paint coverage and leave the well-intentioned homeowner feeling a bit trigger-shy. Just as often, there’s a wax or varnish to deal with, and do-it-yourselfers know that sanding can be not only taxing but really messy. And then there’s veneer wood paneling: Isn’t there something about its hard, almost plastic-like surface that looks like it simply wouldn’t take paint very well? The truth is that, regardless of whether yours is solid or veneer, it’s pretty easy to paint wood paneling. If you’ve ever painted a piece of wood furniture, then you’re probably already familiar with the basic steps that make up the process—though there are a few differences, like protecting neighboring walls and trim or accounting for the grooves of paneling. 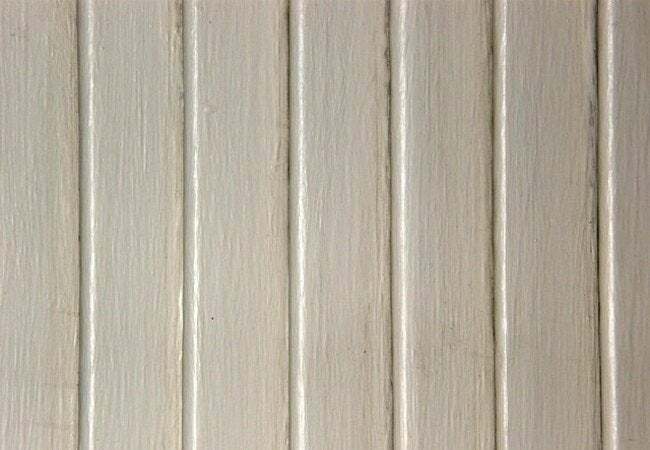 Follow these key guidelines for how to paint wood paneling and you ought to achieve professional-level results. Clean the wall paneling with diluted TSP. Lightly sand the wood surface. Apply two thin coats of stain-blocking primer. Apply at least two thin coats of paint. 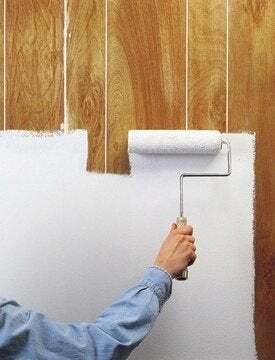 For full details on painting wood wall paneling, continue reading below. STEP 1: Clean the wall paneling with diluted TSP. Any dust, dirt, or oily fingerprints can prevent the paint from sticking well to the wood paneling, so start by thoroughly washing the wood-paneled walls with a solution of trisodium phosphate (TSP) and water. Before you even pick up a sponge to begin using this toxic cleaner, put on protective gear—full-sleeve clothing, rubber gloves, glasses, and a respiratory mask—and open windows in the room to adequately ventilate. Then, dilute TSP in a bucket of water and wipe down the wood paneling with a sponge dampened in the solution. STEP 2: Lightly sand the wood paneling. Next, proceed to lightly sand the walls using a technique aptly known as “scuffing”; the goal here is to create a good mechanical bond between the paneled wall and the initial coat of primer that you will soon be applying. You’ll use a 220-grit sandpaper in even circular motions to do so. STEP 3: Protect the floor from paint splatter using drop cloths and painter’s tape. Save yourself from having to scrub errant paint drips and splatter off the floor after the paint job is complete by laying down a bunch of old newspaper or a drop cloth. If there is molding or ceiling that you do not want the paint to inadvertently color. STEP 4: Apply two thin coats of stain-blocking primer. Having finished scuffing the full width and height of the wood paneling to be painted, give the surface its initial coat of primer to prevent any of the wood grain, imperfections, and the like from showing through the final coat of paint. Choosing the right primer is key. For solid wood, use a water-based product; for veneer, use a shellac-based one. While it’s not strictly necessary to do so, you can have the primer tinted to match the shade you eventually plan to paint the wood paneling. One detail you absolutely should look out for? The words “stain-blocking” on the label. This trait helps hide any knots that appear throughout the wood paneling, or else you may see them bleed through your weekend paint job sometime in the future. Start in with a 2-inch high-quality angle sash brush to cut in at corners, then keep it handy to dab away drips as you work. Since you’ll be covering such a large surface, switch to a roller for the rest of the paint job—you’ll still be able to coat the grooves of paneled walls just fine. In order to avoid ending up with the orange peel–like texture that roller-applied paints sometimes produce, opt to use a foam sponge roller cover (it’s inexpensive and easily purchased at your local paint supply store or home improvement center). Two thin primer coats are normally sufficient. Check your can of primer for instructions on exactly how long to wait between coats. STEP 5: Apply at least two thin coats of paint. Top with your chosen paint applied in the same manner as described in Step 4. While you’re rolling on the paint in thin layers, pay close attention to how much collects in the panel grooves and wipe out any excess that might be too thick and become tacky once dry. Lightly sand the surface between coats, and expect to do two or three in total (leaving adequate dry time between each). It’ll be a weekend project for sure, but, when you finish, you’ll certainly admire the difference painted wood paneling can make in a room! Whether you’ve chosen to paint wood paneling a lighter color to for a very airy farmhouse vibe or a matte black for something cozier and more dramatic, like a library, the fresh color will definitely deliver results.